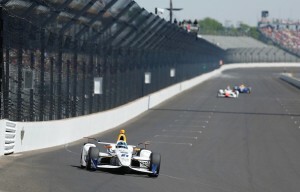 It was sunny, 71 degrees F/22C for the start of Carb Day practice. The track was 82 F/28C and there was little wind. Third and fourth were Chip Ganassi Racing Honda teammates, Tony Kanaan/No.10 NTT Data Chip and pole sitter Scott Dixon/No.9 Camping World. Top Rookie, in fifth position, was Fernando Alonso/No.29 Mclaren-Honda-Andretti Honda at 226.608 mph. He was happy with the session. “It was great. I mean, it was very smooth. You know, the car felt the best so far in the last two weeks. So extremely happy with the car. I was there making some moves, some different lines, just to try what I saw in the last three or four days in different medias from different years, so I was practicing that. I also did in the simulator in the last two or three days, I was putting it in place there. 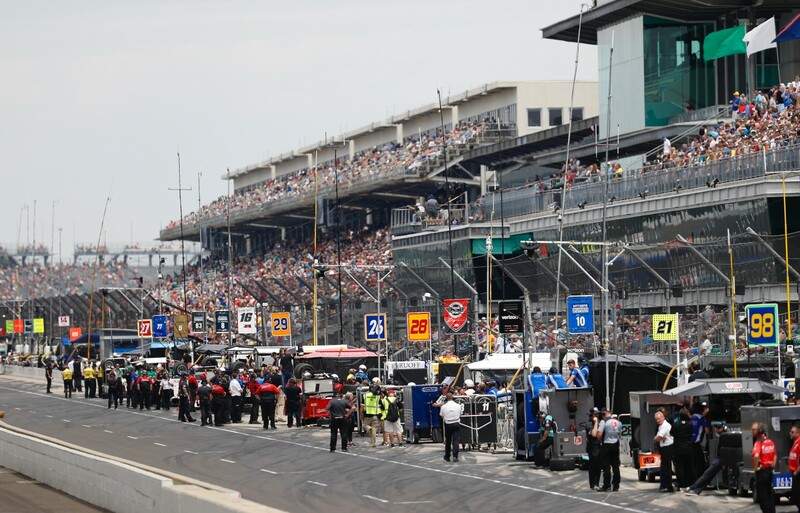 All thirty-three Verizon INDYCARs took to the track Friday morning for the hour-long Carb Day practice, the last opportunity to check out the car before the race. It went well for most. 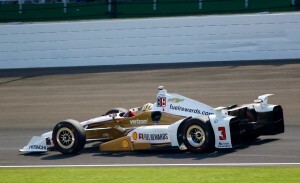 One exception was James Hinchcliffe/No.5 Arrow Schmidt Peterson Motorsports Honda. He blew an engine. The session was busy and who was the fastest driver changed often. 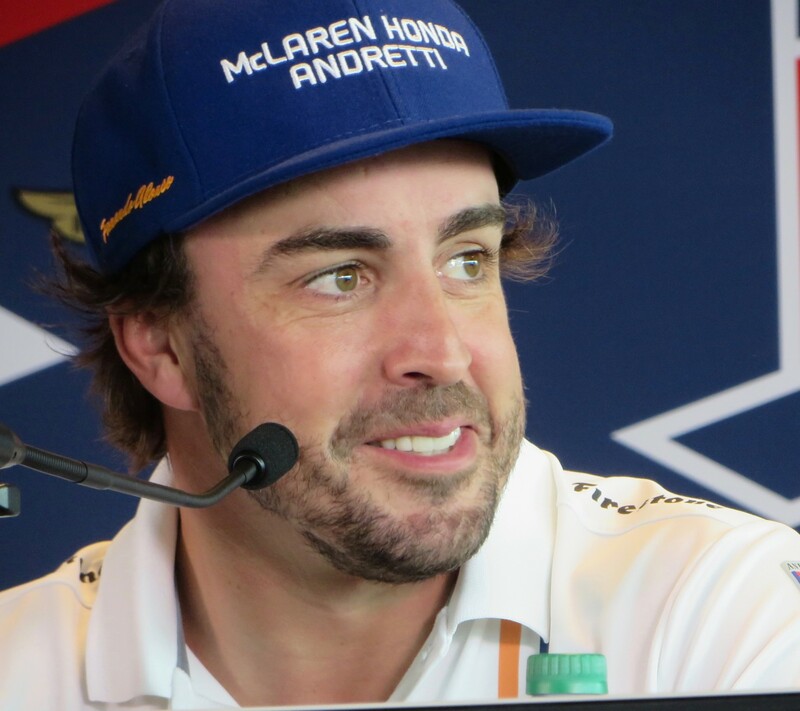 Among those were: Josef Newgarden, Ed Jones, Alexander Rossi, Castroneves, Pippa Mann, Rossi again, Jones again, Conor Daly, Fernando Alonso and then a Caution – all in six minutes. Then Scott Dixon, Juan Pablo Montoya, Alonso again and another Caution. Then Castroneves, another caution for Daly, and quickly another Caution for Hinchcliffe. 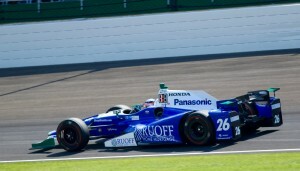 Rookie Ed Jones/No.19 Boy Scouts of America Dale Coyne Racing Honda turned the most laps – 41. Ed Carpenter/No.20 Fuzzy’s Vodka Ed Carpenter Racing Chevrolet ran the fewest-21. 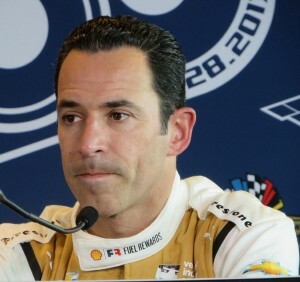 What was interesting to some and amazing to others was how many drivers drove so many laps and so fast, for a Carb Day. The total laps run was 960 in a session which was only half long due to cautions. Copious amounts of oil dry had to be laid in Hinch’s path. The track session was extended five minutes to 12:05pm due to the length caution to clean up the track. 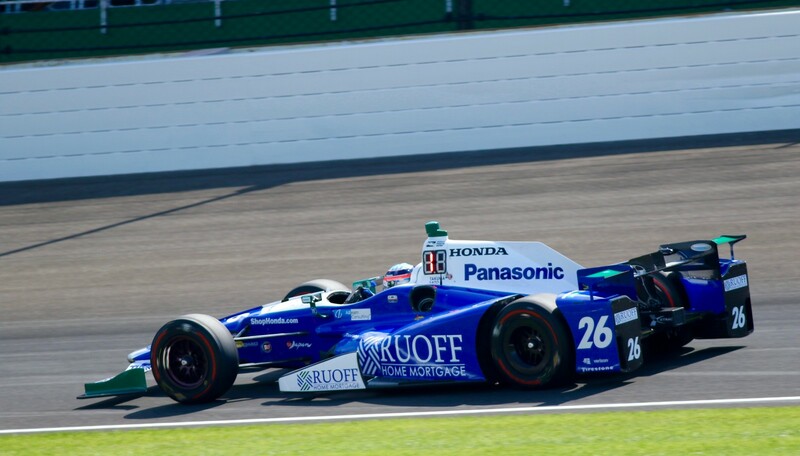 The only penalty assessed during the session was to Mikhail Aleshin/No.7 Schmidt Peterson Motorsports Honda, for making contact with pit personnel. JR Hildebrand/No.21 Preferred Freezer Services Ed Carpenter Racing Chevrolet was the fastest car without a tow, at 220.881 mph. Most drivers had a tow, but six drivers were able to get out in clean air. For a long time, Jack Harvey had the fastest NT time of 220.744 mph. Some others were James Hinchcliffe, Sebastian Saavedra and Charlie Kimball. Chevrolet lost an engine earlier in the year, and they’ve changed two engines at Indy due to crashes. Will Power/No.12 Verizon Team Penske Chevrolet won the Pit Stop Challenge contest, making it seventeen wins for Penske Racing. He beat Hinchcliffe in the finals. Power’s best time was 11.619 seconds and Hinchcliffe’s was 13.223, total time Green Flag to Finish Line. Crew Chief Matt Jonson has now won three times, as have three other Crew Chiefs: Chuck Sprague, Rick Rinaman and Owen Snyder. Power spoke highly of his crew. “These guys, all the teams, all the crews on all the cars at Team Penske work very hard in the offseason practicing pit stops, you know, and working out. They’re all fit, and they’re all ready to go. That was an example of four or five perfect pit stops, no mistakes. The lads were so quick, they fled after the presser before a nice group photo could be taken. Other contenders were Sage Karam/No.24 DRR Mecum Auctions Dreyer & Reinbold Partners Chevrolet: Charlie Kimball/No.83 Tresiba Chip Ganassi Racing Honda; Mikhail Aleshin/No.7 SMP Racing Schmidt Peterson Motorsports Honda; James Hinchcliffe who used the Honda of his teammate, Jay Howard/No.77 Lucas Oil/Team One Cure, as his No.5 was having an engine change; Castroneves; Carpenter; Graham Rahal/No.15 Steak N’Shake Rahal Letterman Lanigan Racing Honda; Ryan Hunter-Reay/No.28 DHL Andretti Autosport Honda; and Dixon. Other awards were presented Friday. Adam Rovazzini, the chief mechanic of the No. 50 Michael Shank Racing with Andretti Autosport Honda driven by Jack Harvey, was named recipient of the Clint Brawner Mechanical Excellence Award. 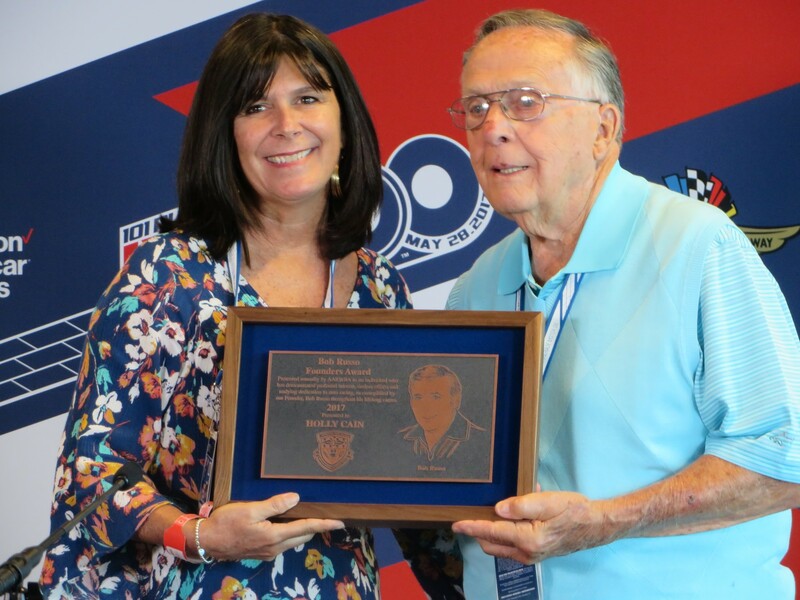 This honor goes to the Indy 500 chief mechanic who exemplifies the mechanical excellence, ingenuity and perseverance of its namesake, the legendary mechanic, Clint Brawner. Rovazzini received $5,000 from Firestone Racing and his name on a plaque which is in the Speedway Museum. The Bob Russo Founders Award went to Holly Cain, a much-respected and popular motorsports journalist for the past 25 years, who has shown courage and provided inspiration in the face of personal adversity. Cain is the first female as an individual to receive the award in the 13-year history of the award. She has worked for several newspapers, AOL, Foxsports.com, NASCAR.com and written a book on NASCAR driver, Rusty Wallace. She has gone public with her breast cancer diagnosis and been a strong advocate and fundraiser for the disease. 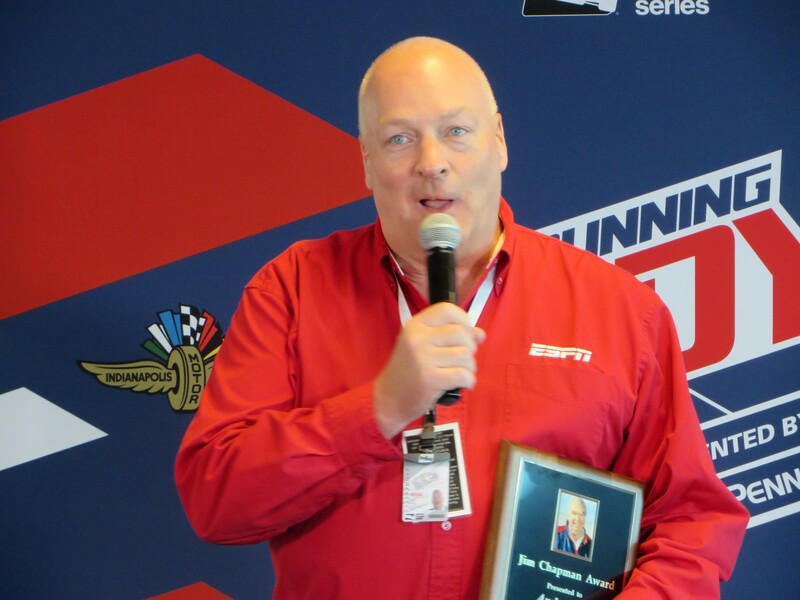 Andy Hall received the annual Jim Chapman Award for excellence in motorsports public relations. He currently works for ESPN and has worked for NASCAR and INDYCAR in the past. In keeping with a new custom, IMS President, Doug Boles, unveiled the logo for next year’s Indy 500. He spoke of the design challenges, looking forward and yet incorporating parts of the existing logo. And he put in a plug for the 500 hours of Reservations – time to renew Indy 500 tickets at this year’s prices. 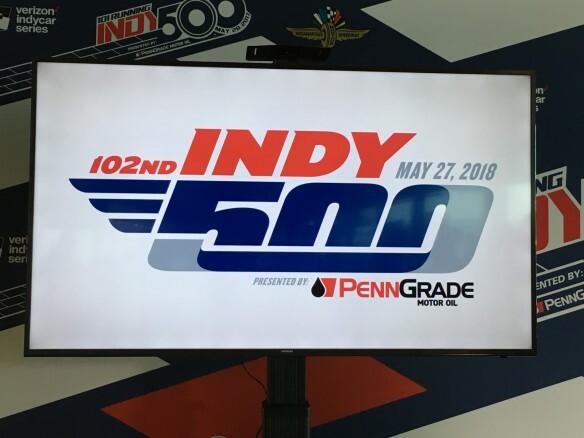 “In an evolution from the logo for the 100th Indianapolis 500, the design for the 102nd “500” includes the iconic IMS “Wing and Wheel” logo and its spirit of speed. The “500” is underlined with a segment of the world-famous 2.5-mile oval, designed to represent the exit of Turn 4 down the main straightaway and into Turn 1. The typeface represents the athleticism, competition and cutting-edge technology that are hallmarks of “The Greatest Spectacle in Racing. Every part of the logo leans with a 20-degree shear, symbolizing the relentless forward motion of the race’s competitors and the Indianapolis 500’s second century of competition. The color scheme features red, white, blue and steel, which together represent the American spirit and tenacity that has formed the core of the Indianapolis 500 since the inaugural race in 1911. These colors also were included in the logo for the 101st Indianapolis 500 that is taking place this Sunday, May 28, maintaining continuity between the two events.” So now you know. 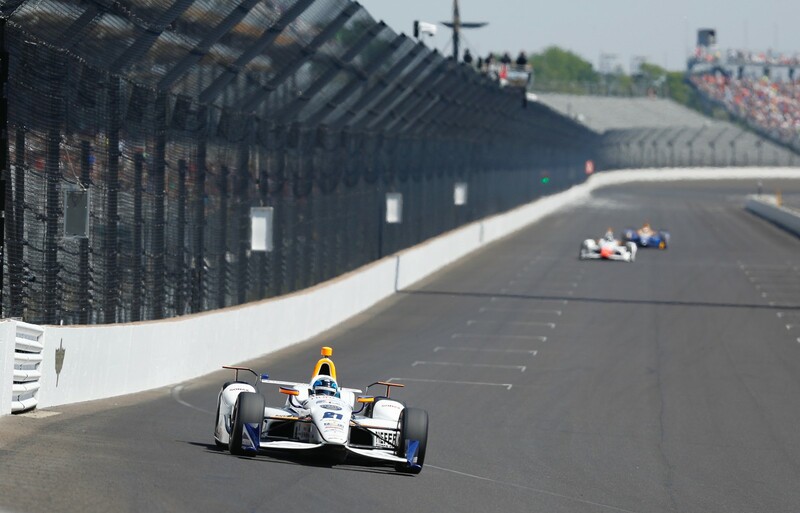 This entry was posted in INDY 500, Indy Lights, IndyCar by Lynne Huntting. Bookmark the permalink.